ACG performance improvement work in this area is designed to help determine why a company is experiencing problems collecting its receivables and what actions need to be taken to resolve the issue. Receivables problems can be a source of financial difficulty when they are not effectively managed. For instance, understanding the issues for late payment or taking deductions (other than credit issues) may include disputes over pricing, quality issues, unauthorized returns, delayed shipments, etc. Building the metrics and reporting on past experience provides the evidence to make informed decisions. By classifying and coding these instances by reason, ranking by dollar amount and frequency, and charting and trending the data provides the visual reports which lead to possible solutions. In addition, predictive modeling can enable collectors to take preemptive actions on invoices that are likely to become delinquent or to better utilize staff’s time based on expected time to payment. The following bar chart illustrates one of the reports from a collections study. 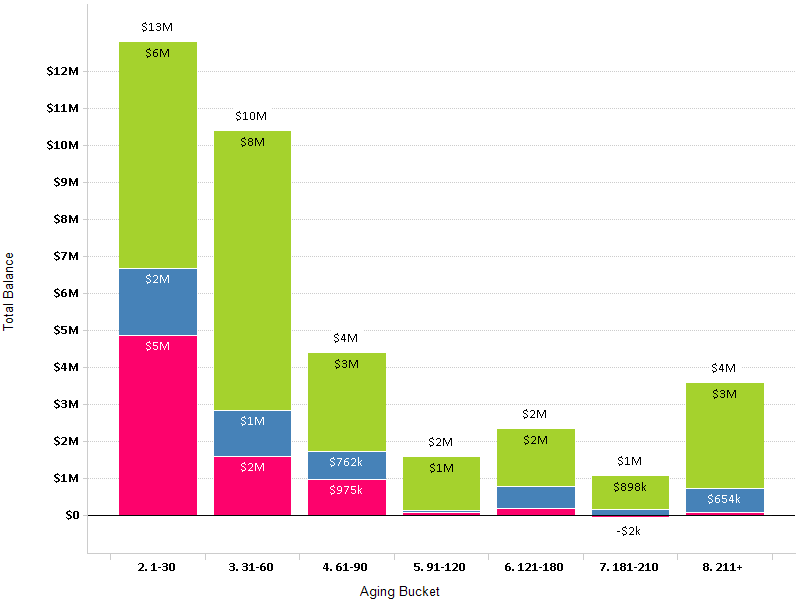 The chart shows the distribution of outstanding balances by aging bucket. •	The data from receivable aging reports, disputes, unapplied credits, etc., are classified, coded and then analyzed to understand patterns, cause and effect relationships, frequency of occurrence, etc. •	Based on the analysis of these reports, reasons for late payments such as lax credit administration, quality problems, or other problems caused internally are determined and corrective actions are taken. •	Results are graphed visually for better understanding and interpretation. •	Because customers do not treat and pay their suppliers the same, supplementing or replacing credit bureau scoring in the credit analysis process is accomplished by using predictive modeling. •	Using the company’s actual customer payment experience, a predictive model is built to score the credit risk associated with the specific customer; appropriated actions are taken based on this score. •	Criteria used includes invoice amount, due date, whether it is under dispute or not, number and dollar amount of paid invoices, number and dollar amount of invoices paid late, ratios of paid to late paid invoices, average days paid late, etc. •	Collect receivables faster, reduce write-offs and free up working capital. •	Reduce the cost of obtaining credit bureau data. •	Prioritize the allocation of collection staff by concentrating efforts on those accounts most likely to become problems not on those that will eventually pay. Click on the link entitled Reducing Credit Risk by Modeling Customer Payment History found in the Resource Center for the case write-up.